I don't understand why he would have done this. Surely travelling at 60 mph would be obvious on his GPS? Even Guinness would want to understand why he is doing miles in a minute. What you are saying ties up, but surely he couldn't hope to get away with this? I understand him being in the back of a vehicle and it going at 7 mph (it sounds ridiculous), he could hope to get away with that. Data can be doctored after the entire run. Seriously, if anyone who is reading this who is connected to RY or Team Geezer, this sounds like a really unsafe situation. Please don't keep going to try to prove a point. Take a good, healthy break, at least a day, and then decide if you want to keep going again just for the experience. Falling asleep on your feet on the highway is not safe. His grit isn't in doubt. There's no need to hurt himself proving a point. This ain't no marathon little boys. Ultra-marathoners (even suspect ones) are a lot tougher than you boys on this board. A marathon is just a warm-up for most of us. Reminds of the fella way back on the thread who wanted to know why he wasn't claiming some US ultra record. This is a fair point. I think both cases are somewhat far-fetched -- that he ran unassisted through the Mohave back country for 4 hours on a 95 degree day (temps were probably 75-90 as he ran before noon) or that he got a ride at highway speeds and then had to fudge the GPS. Everywhere else the RV was going running speeds. Why screw that up on the first state with a runner in the vehicle? It would be really helpful to have more info of that truncated segment, even a screenshot for the time being. Just kind of coincidental that's the one that's cut off. WHY DOESNT HE SEE HIS OWN CHILD IN YEARS? The 3:42min run has a big ole gap in the middle, paused while taking a ride in the RV, and is why it is conveniently cut off. 7:30 departure + 0:48 run (4.6mi) + 1:42 run (10mi) + 0:10 RV ride (10mi) + 2:00 run (12mi) = 12:15 arrival and 36 miles covered. What i'm guessing is that the GPS watch was paused while he rode in the RV so it didn't show a 60mph segment. I'm thinking it showed a gap or some other anomaly on the map so he cut it off. Probably a straight line with no time or distance associated from where he paused to where he started again. 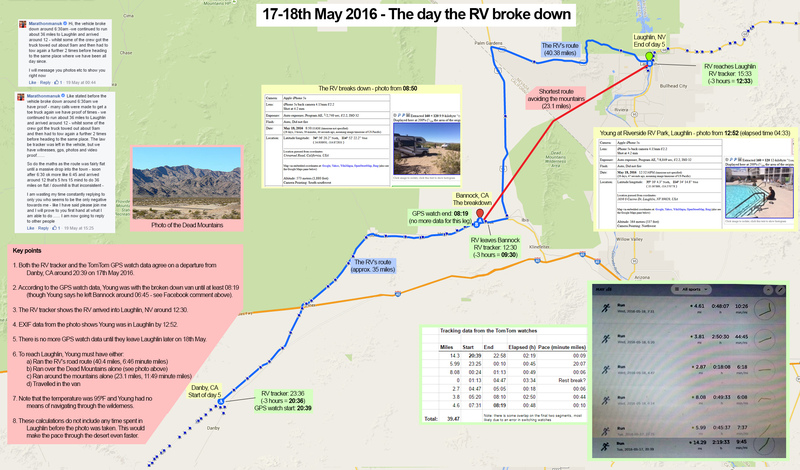 The only way I can think this went down is that the RV driver catches Rob, and says "look you lost lots of time because we broke down, you shouldn't lose time from your record attempt, we'll make up the time you lost and I'll adjust the data later". The RV driver was meant to be a technology genius. The RV driver works for Skins so I assume he has a vested interest in the record being broken. RE: Robert Young fakes run across America 6/15/2016 5:46PM - in reply to not the full shilling? This makes sense. But then he ran 10 miles less than he was claiming. This isn't a big issue as he was claiming to be aiming for 3000 miles (over 200 hundred more than was required) and so wouldn't have expected people to be looking for a missing 10 miles in the desert. But the time stamp of the photo at the pool screwed this up. Whilst the blog had the extra 10 miles, what he submitted to the Guinness people wouldn't have had this (and I doubt they would use google maps and check that there wasn't a missing section). However because he hasn't ran the full way, his attempt is void for record purposes, which is why he can't upload his data. What, he's swimming across Lake Michigan?! Why is he doing this run in the summer? There's currently another man, Bjorn Suneson, doing a transcon run (though not for a record) and he's taking a more northern route. Perhaps there should have been more planning. RE: Robert Young fakes run across America 6/15/2016 5:54PM - in reply to Seriously mate? I thought we had established that transcon runners are modern days Jesus'es. No he is not mentally retarded, he is rather clever. He is a narcissist, craving for attention and fame. Without Asher, he would have broken the record and been considered a running god in the UK. My vote is he was picked up by the RV. His last known location puts him in that straight section on north Hwy 95 when the RV averaged 50 mph. The next two sections the RV averaged 60mph (and had a hard right turn) and 55mph (which meandered through the mountains). Not that the crew seem to know much about speed limits, but if they are going 65mph on that stretch, it takes a minute or two to stop and talk to, then pick up Rob, and then when they get back up to speed they've lost a minute or two. It still leaves them needing to fabricate the GPS data, which is cut off in their TomTom summary screenshot. It would be quite interesting just to see the shape of the map thumbnail, since sequential thumbnails seem to line up. It's sort of like making meatloaf. Meatloaf is mostly ground beef--real meat--but you add some breadcrumbs, egg, a little tomato paste: extenders. I'm not saying that this IS what happened. I'm saying that the LR sleuths are, as far as I can tell, presenting evidence about the Western portion of the race, the "run" through the great wide deserted desert wastes, that seems to make this sort of explanation more rather than less likely. It's quite a detective story and I'm sure things will tighten from here, explantation-wise, as various people, like mad scientists, consider and reconsider the evidence and evidentiary gaps.